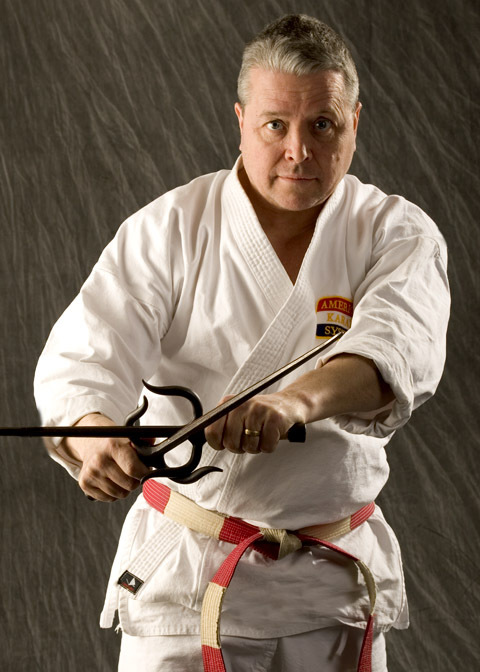 Frederic A. Reinecke, 9th Dan, is the Chief Instructor of the American Karate System, and a member of the AKS Board of Advisors. Fred was unanomously selected in 2017 as Chief Instructor upon Mike Sullenger's decision to step-down due to health reasons. Fred also has the dubias honor of being the "official" AKS photographer. 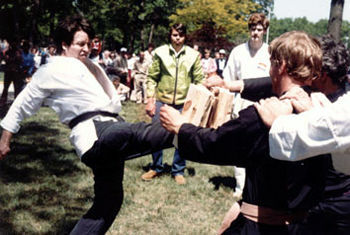 A Muskegon, Michigan native, Mr. Reinecke's young adult years prompted him to seek a method of self-defense. In the year following his graduation from high school, Mr. Reinecke was attacked on two different occassions. Though the injuries were minor, both incidents took their toll, leaving him with a keen desire to learn how to defend himself. Soon after joining the United States Army, Fred saw his first Bruce Lee movie and was inspired (as were countless others in this era). In 1973, while still employed by Uncle Sam, he was sent to an assignment in the Republic of South Korea. It was during this tour of duty that Fred really got involved in the martial arts. 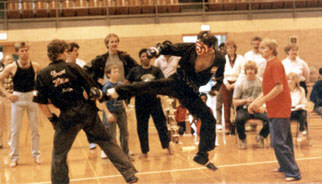 Upon completion of his time in Korea Fred returned the U.S. as a newly certified Black Belt in Jin Moo Kwan - Tae Kwon Do. After his discharge from the U.S. Army, Mr. Reinecke returned to Muskegon, Michigan. In 1975 he started taking classes at Muskegon Community College (MCC). It was here he met Mr. Lieb who was conducting classes in the American Karate System. Following his graduation from Central Michigan University, where Mr. Reinecke had transfered to finish his degree program, he returned to Muskegon. 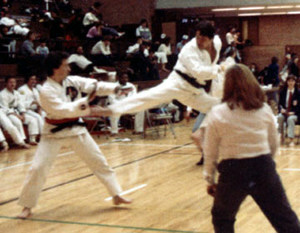 He assumed the teaching responsibilities from Mr. Lieb, and has been the American Karate Instructor for the Muskegon Community College classes since 1980. Fred also taught classes through Orchard View Continuing Education from 1990 to the present. Fred has been an active competitor from 1976 to the present, winning more than 100 trophies and awards. Among these accomplishments are six Grand Championships. 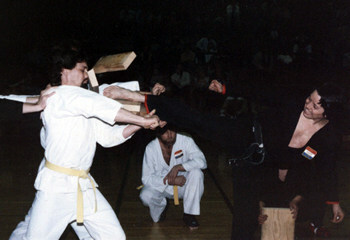 During the 1996-97 time frame, Fred was rated among the top 5 black belt competitors in senior fighting and forms by the Michigan Karate Circuit. 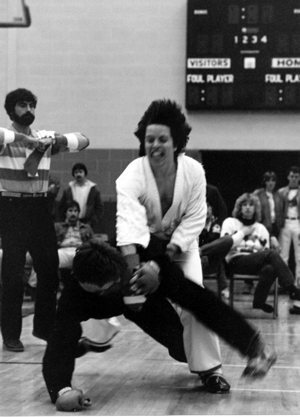 In August of 1998, Sport Karate International Magazine rated Mr. Reinecke 3rd Internationally, 2nd in the U.S. and 1st in Michigan in Senior Black belt Men's fighting. Fred enjoys competing even today and is a regular at many of the Michigan tournaments. Mr. Reinecke continues to train, support and promote the American Karate System through his instructional endeavors. He is co-editor (along with Mr. Sullenger) of the AKS "Punchline" newsletter. He continues to hone his skills and techniques by attending seminars with such noted instructors as Tadashi Yamashita, Shorin-Ryu and Weapons Master, and by training with other talented black belts like Mr. David Hayes, 6th Dan Shorin-Ryu and Mr. Tom Twining, 6th Dan Chi Do Kwan Karate Do / 7th Dan AKA.